It is our pleasure to serve the community by creating the highest quality learning environment and a fertile ground for self development. Our goal is to awaken and nurture the incredible abilities that everyone carries and to help each practitioner realize their fullest potential. In each class the student will learn simple, practical principles and techniques of self defense that will empower them and their children. On another level, the student will learn how to use the "physical" art as a vehicle of "inner" self development, enhancing mental and emotional balance, cultivating more meaningful relationships, simplifying seemingly complex issues, and managing conflict more efficiently in all areas of life. Because Jiu-Jitsu is based upon universal principles that govern every aspect of existence, as those principles are learned and assimilated, they gradually will permeate the student's entire life - physical, emotional, mental, and spiritual, bringing a greater overall sense of balance, health, and well-being. Begin your inward Quest today. Our unique facility is full of character, built to meet all of your training needs in a comfortable family environment. On October 1, 1913, Helio Gracie was born in Brazil. As a teenager, he and his older brother Carlos were introduced to traditional Kano Judo by Mitsuyo Maeda, a Japanese immigrant to Brazil. Not having the physical attributes to perform some of the techniques, Helio, over a period of several years, modified the art to rely on leverage, positioning, and timing rather than strength and aggression. In 1925 Carlos and Helio Gracie founded the original Gracie Jiu-Jitsu Academy in Rio De Janeiro, Brazil. Over the next 50 years, the brothers and their sons taught and spread the art, fighting all challengers to prove the effectiveness of their style. During the last 10 years of his life, Helio wore a royal navy blue belt instead of the currently acceped red. When Hélio Gracie was asked why he was wearing a royal navy blue belt, he explained that in the original Gracie Academy there were no belt level differentiations based on fighting skills. Belt colors were awarded only to distinguish instructors from students. In order to separate themselves from Judo instructors, who were teaching what they considered to be a limited sport for competition rather than a complete martial art, they didn’t utilize the black belt. At that time, Gracie Academy Instructors wore a light blue belt and head professors wore the royal navy blue. Only those who completed the professor’s course under the Grandmaster himself could wear the royal navy blue belt. With the creation of the Brazilian Jiu-Jitsu Federation in 1967, the belt system of Judo was adopted. In addition, a framework for sport Jiu-Jitsu, including a point system and weight divisions, which had never been accepted by Grandmasters Carlos and Helio before then, was established. As Judo was attracting a large following in Brazil under this sportive system, Grandmaster Helio agreed to adopt this structure under the assumption that recreational Jiu-Jitsu tournaments would not have a negative effect on his complete system of self defense. In the early 1990’s, Grandmaster Helio realized that the mutation of his art was a direct result of the point-based, sport Jiu-Jitsu competitions, and that red belts were being awarded without his consent by individuals who weren’t red belts and black belts were being awarded to practioners who had a less than complete understanding of his self defense system. For these reasons, he decided to return to his original royal navy blue belt to separate himself from the federation and from sport Jiu-Jitsu. Grandmaster Hélio felt very comfortable wearing a belt that indicates the first level of learning, and it was his favorite color. Though Jiu-Jitsu was famous in Brazil, in the early 1990's, it was little-known outside its mother country. To prove the superiority of Gracie Jiu-Jitsu over other styles of martial arts, the Gracie's founded the Ultimate Fighting Championship in 1993 in the United States. This no-holds-barred tournament pitted top competitors from all over the world, and from all styles, against each other. The world was shocked when one of Helio's sons, Royce, entered UFC 1 on November 12, 1993, and defeated all opponents. Though every other fighter was bigger and stronger, Royce won each match with apparent ease. This pivotal event opened the world's eyes to the effectiveness of Gracie Jiu-Jitsu in a real fight, dispelling unrealistic expectations regarding the effectiveness of other fighting disciplines - proving that technique overcomes strength and that the smaller, weaker opponent can overcome the larger and more athletic one. Royce went on to submit his way through multiple opponents of various styles in UFCs 2, 3, and 4, and in Japan's PRIDE organization. After Grandmaster Helio Gracie passed, Royce Gracie decided to honor his father by retiring his black belt and wearing a royal navy blue belt with his father's signature. Like the one Helio wore the last 10 years of his life, and like the Gracie Jiu Jitsu Professors wore prior to the creation of the Jiu-Jitsu Federation in 1969, Royce now awards his black belt Professors with a royal navy blue bar bordered in white to honor the continuation of his father's complete form of self defense. Jared began training Jiu-Jitsu in late 1995, inspired by Royce Gracie’s success in the Ultimate Fighting Championship. Over the next two decades, he was significantly influenced by the Gracie family, learning from Grandmaster Helio himself, and apprenticing himself to Royce as a dedicated student. Jared founded iQ in 2005 and in January 2008 began teaching classes in Benton Illinois. His hard work and perseverance paid off, and on July 17, 2010, iQ Jiu-Jitsu became the first Royce Gracie network in the state of Illinois. For the first 7 months, he slept on the mats while erecting the business and building relationships. An avid learner, Jared devoured any educational material he could get his hands on. Over a lifetime of investigation, he began to notice that there are common themes that govern every field of study. Through years of deliberation, he translated these universal axioms from the arts and sciences into Principles that underlie every aspect of Jiu-Jitsu. Though these governing Principles are inherent to the art and utilized by every practitioner, as a contribution to the Jiu-Jitsu community Jared has identified, organized, and raised them to a level of conscious awareness. 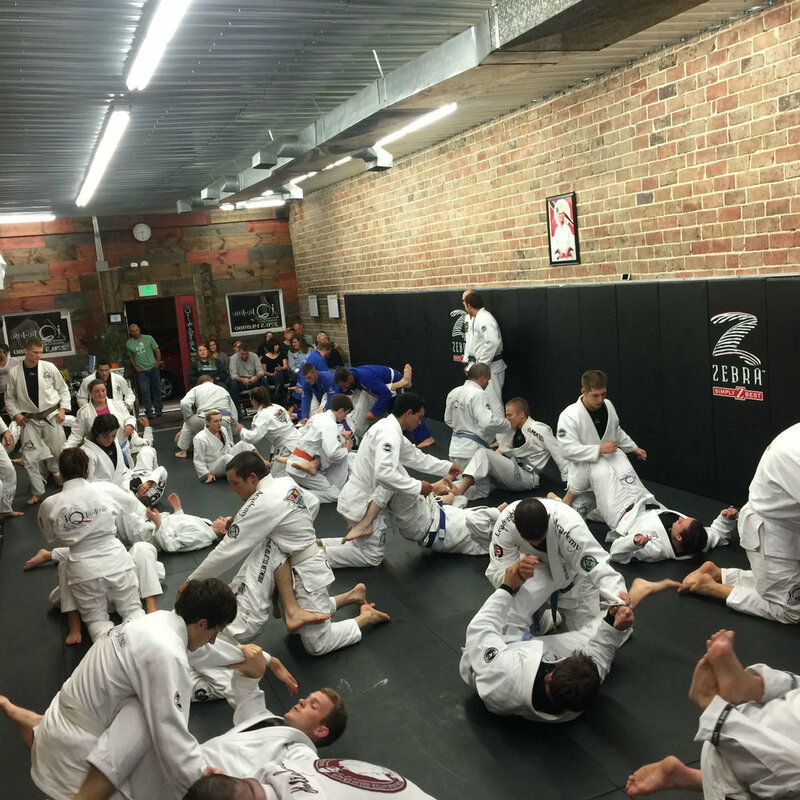 Jared strives to continue the legacy of Grandmaster Helio and Master Royce Gracie by preserving the complete form of self defense created by the Gracie family. Each promotion is a remarkable achievement, representing the student's personal growth and effectiveness in applying the Art. Rank is divided into two separate systems, one for BullySafe practitioners (Squirrels 4-8 and Juniors 9-15) and one for Adult practitioners (16+). All new students begin as a white belt - 4 stripes are awarded on each belt; when these have been earned, the next step is promotion to the following belt.